A couple of weeks ago I watched Hide And Creep on Netflix, and last night I watched Altered. You think it's a Yankee? Hide And Creep is rednecks vs zombies, and Altered is rednecks vs aliens. 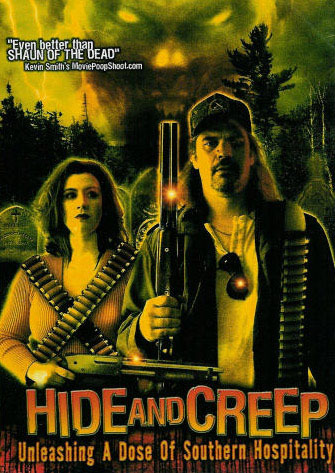 Hide And Creep is the superior movie — I feel it is the sort of movie Kevin Smith would have made if he had grown up a horror movie fan in Alabama, rather than a comic book fan in New Jersey. Altered is higher budget, but it takes itself more seriously, which works against it to an extent. Still, if you have a perverse affection for southern culture like I do, then both of these movies need to be in your queue. Hide And Creep: Buy it on DVD. Altered: Buy it on DVD or rent it on Amazon video on demand.